SKip Playground was build by the community in 1991 and is located at the City Center Complex in Stow. 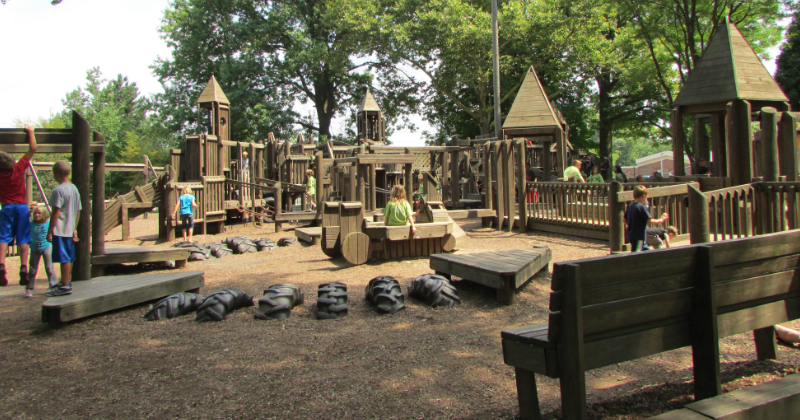 The castle like playground is located under a canopy of trees and consists of a large 11,000 square foot multi-level wooden structure with many tunnels, platforms, slides, bridges, walkways and more. May 2016 UPDATE: The playground has been torn down. If they rebuild it we will update with new details. Thank You! SOAR Fully Accessible Playground – The park has so many sporting options, including basketball, tennis, volleyball and soccer. The courts and fields are in the front section of the park. Located at the back of the park is a very large fully accessible playground with a rubber surface. It is also home to Bow Wow Beach Dog Park. KidStation Playground – KidStation Playground – A fun fire station themed playground build in 2015 and located next to Stow Fire Station #3. The playground equipment is geared toward elementary age children. In addition to the playground there is a miniature city with paved roads that kids can drive their bikes on. 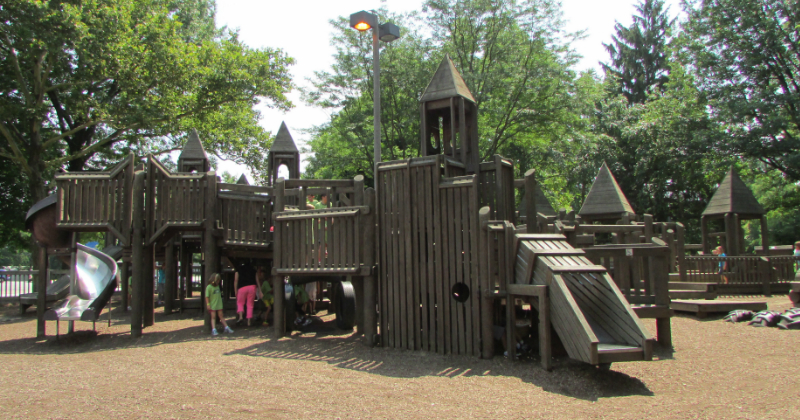 The playground looks like a castle and has lots of different ramps, platforms and slides for kids to explore. There are two swing-sets containing regular swings, a tire swing, an infant swing and an accessible swing. There is even a large sandbox located in the middle of the structure. 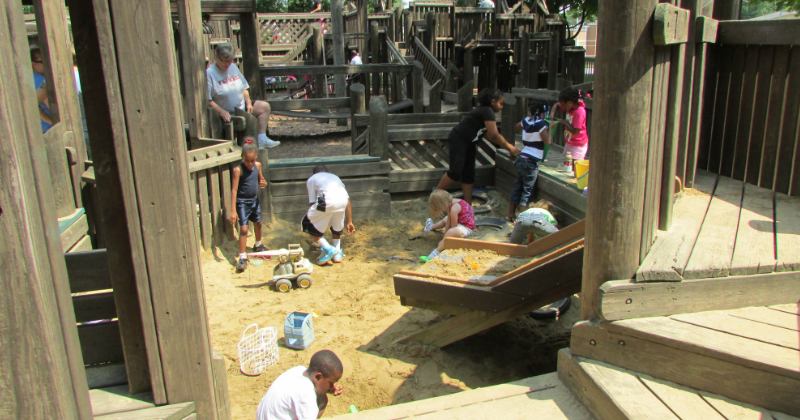 Make sure to pack a bucket, a few shovels and some sand toys to bring with you to the park. Because there are so many trees the playground has a large amount of shade, which is perfect for really hot days. 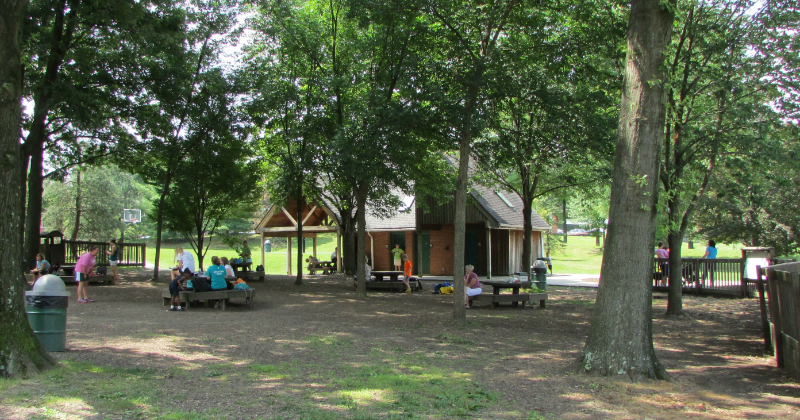 There are also plenty of picnic tables near by, nice restrooms and some wide open grassy fields to play in. I see you updated to show its “under construction” but thought some more details would be good to provide readers. The handicap accessible area has been completely removed, as has a lot of the climbing and balance items. Swing sets (accessible, infant, and school-age are gone. Mulch has been entirely removed and replaced with sand. Overall it’s significantly worse and not accessible at all. They did add more seating within the wooden area and it’s still very shaded with clean restrooms on-site making this a good option. Compared to SOAR on Stow Rd I like that it’s more enclosed and kids can’t really wander off. Thank you for the additional details! Do you know if they are finished with the construction, or will they be making more changes? Visited today. Whole park is under construction. No swings, jeep play area or tires in the ground. Thank you for letting us all know. I just updated the article to indicate the playground is under construction. Did you get a chance to visit the other two nearby playgrounds? KidStation or SOAR playground?